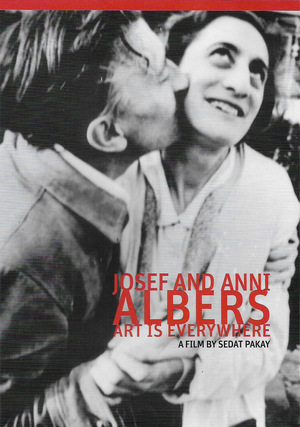 Sedat Pakay’s documentary film is the first and only time that the work and lives of Josef and Anni Albers have been viewed in tandem. Pakay worked closely with the staff of The Josef and Anni Albers foundation and its Executive Director, Nicholas Fox Weber, who was a close friend of both the Alberses, and conducted a number of unprecedented interviews with people significant in both of the Alberses’ lives. The film includes rare footage of the art of both Josef and Anni, and insightful commentary from personal friends of the artists, including architect Philip Johnson, who arranged for them to come to the U.S. as refugees from Nazi Germany in 1933. Josef Albers (1888-1976) was an influential teacher, writer, painter, and color theorist–now best known for the Homages to the Square that he painted between 1950 and 1976 and for his innovative 1963 publication The Interaction of Color. He was also the first living American artist to be honored by a solo retrospective at The Metropolitan Museum of Art in New York, in 1971. Anni Albers (1899-1994) was a textile designer, weaver, writer, and printmaker who inspired a reconsideration of fabrics as an art form, both in their functional roles and as wall-hangings. Often considered the foremost textile artists of the twentieth century, Annie Albers was the first weaver to have a solo show at The Museum of Modern Art, in 1949.